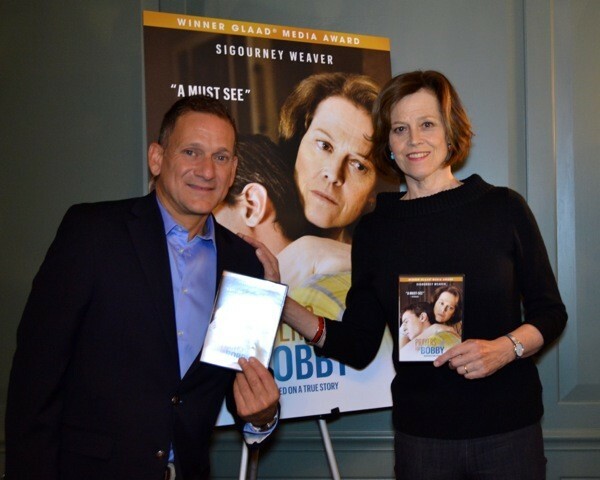 To celebrate National Coming Out Day, a screening of "Prayers For Bobby" was held in New York City on Friday night with the film's star, Sigourney Weaver, in attendance to talk about the making of the film and the impact it has had. "Prayers For Bobby," based on the book of the same name written by Leroy F. Aarons, tells the true story of Mary Griffith, a religious mother who is unable to accept her gay son, Bobby. He commits suicide and in the wake of his death, Griffith comes to terms with her own homophobia and finds support in new community in groups like PFLAG (Parents, Families and Friends of Lesbians And Gays). When the movie premiered on Lifetime in 2009 it was met with universal acclaim and was eventually nominated for two Primetime Emmy Awards: Outstanding Made for Television Movie and an Outstanding Lead Actress in a Miniseries or a Movie nomination for Weaver (her role also garnered her a nomination for Best Actress at the Golden Globes and Screen Actor Guild Awards). Four years later, after the award nominations and eventual GLAAD Media Award win for Best TV Movie or Miniseries, "Prayers for Bobby" is finally receiving a mass-distribution DVD release. The DVD will now be available at retail giants such as Walmart, Target and Best Buy and can reach even a larger audience that perhaps missed the film when it originally premiered. The Huffington Post chatted with some of the people who were crucial in getting "Prayers For Bobby" made, including Mary Griffith herself, who spoke about how the film had affected her personally. "Seeing the film gave me a clear picture of how the laws of cause and effect led our son to suicide," Griffith said. "Everything I did or said finally pushed him over the edge. I realized it is never too late to right an injustice done to our son and the LGBT community. Most of all, I realized God did not heal our gay son because he was perfect from birth. I was the one in need of healing. I was the one sick, with ignorance and homophobia. Knowing all that has resolved my feelings of guilt, giving me a measure of closure and peace." Jody Huckaby, the Executive Director of PFLAG National, which plays a major role in the film and also participated in the DVD re-release (in the first 10,000 copies of the DVD a two-sided insert with information about PFLAG and The Trevor Project will be included), told The Huffington Post about how the film impacted the organization. "...The film inspired many people to take action, whether it was visiting their local PFLAG chapter, or starting a chapter where there wasn't one, or working within their faith communities, schools, and workplaces," Huckaby said. "Even now, we continue to hear from people all over the world about how Mary's story changed their lives." During the post-screening Q&A, Weaver talked about how the film had personally affected her on many levels. One example was this past Spring when Weaver was starring on Broadway in the play "Vanya and Sonia and Masha and Spike," young men would come up to her at the stage door after the performances to talk about how the film had helped them come out and deal with being gay. Weaver also commented on her love for her gay fans saying, "I'm grateful for [my gay fanbase]. I've always felt a misfit myself, I understand that. I'm grateful that through one's work someone can send a message of acceptance and courage." Thankfully, Weaver's work in "Prayers For Bobby" and Mary Griffith's story will find a second life now that it is available for a new audience to discover with this DVD re-release. "Prayers For Bobby" is available now on DVD. For more information on the film and the story of the Griffiths click here. Daniel Sladek, Executive Producer of the Emmy Award nominated and GLAAD Media Award winning film "Prayers for Bobby" with star Sigourney Weaver at the NYC screening and panel discussion on National Coming Out Day.